A few weeks ago, I was happy to attend Young Audiences’ third Art Crawl, held this year at the Single Carrot Theatre adjacent to YA’s offices. For those of you who have not attended this annual event, I highly encourage you to do so. First of all, you’ll get to party with a group of fun, interesting, entertaining and dedicated folks. Secondly, you’ll get to enjoy the learning environment presented to the kids who attend YA’s Summer Arts & Learning Academy (SALA). And by that, I mean you’ll act, play music and create artwork, which helps you understand your reading assignment or your math homework. And finally, you get to nosh on great hors-d’oeuvres and sip handcrafted cocktails created by some of YA’s board members! As always, I find myself splitting my time between talking to people I’ve met in the past, and meeting new folks who have interesting stories to tell. This time was no different. Balancing a plate of delicious appetizers from Copper Kitchen and a glass of wine provided by North Charles Fine Wine & Spirits, my husband and I soon found an empty spot at a table and introduced ourselves to Cori Daniel and Carlotta Williams. Turns out they were actually a teaching artist/teacher team who would later explore the book, Tar Beach, a story by artist Faith Ringgold recalling the dream adventure of a young girl flying high above her neighborhood in 1939 Harlem. No matter the genre, the goal is making sure the children stay focused on the subject matter, sneakily presented as a lot of fun. But I didn’t know this yet. What I did find out though was how long they had been teaching, what they taught, and I got to observe their obvious enthusiasm for the children and learning. Their animated conversation about their SALA classroom was fascinating, as were their fond memories of inspiring kids to learn while the children used their imaginations to improve their reading scores. Oh, did I just use inspire, imagine and improve in one sentence? Yes, I did, and that is, of course, no accident. 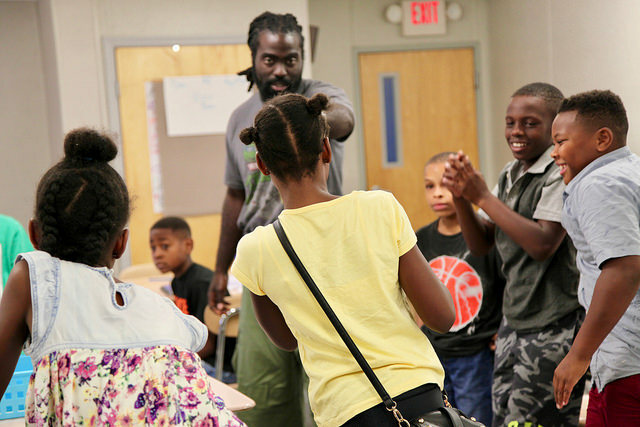 Having witnessed teachers and children in action in several of SALA’s classrooms this summer, and getting a chance to actually engage in it myself during Art Crawl is to truly understand how those three words create an arts-integrated learning environment that SALA uses to stem summer learning loss and bridge the Inspiration Gap. 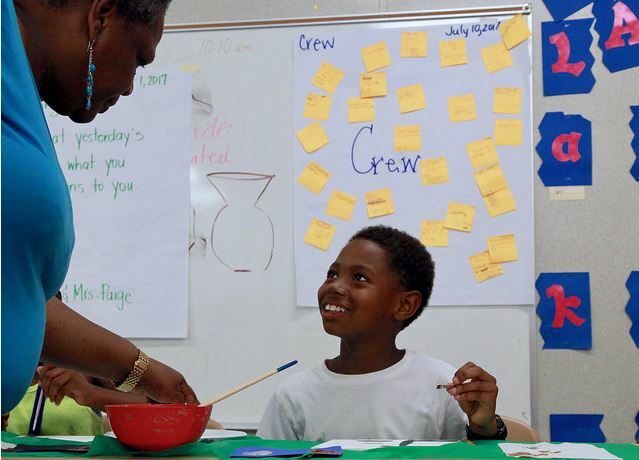 Carlotta Williams, a second-grade teacher, co-taught literacy with artist Cori Daniels in Summer Arts & Learning Academy. 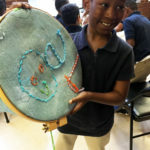 In SALA’s five-week summer classrooms, kids use a wide variety of art techniques to help them master core subjects – whether it’s textile art to illustrate a story they are studying or rapping their multiplication tables or dancing to show character development. No matter the genre, the goal is making sure the children stay focused on the subject matter, sneakily presented as a lot of fun. And so it was. 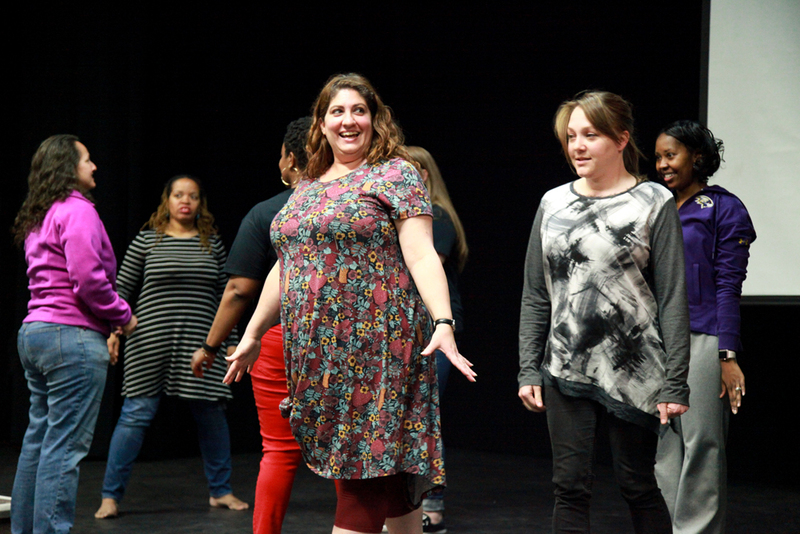 In the segment taught by the second-grade teacher and teaching artist I had just met, we warmed up with some dance movements to highlight acting concepts. Then we looked at the pictures in the book and explained what we saw in them. Finally, we paired off and used our imaginations to explore a special place for us – one that made us feel warm and welcomed. Next up was a math segment, guided by teaching artist Nadia Rea Morales and teacher Jose Hernandez. With a chart in the room illustrating ones as yellow, tens as red, and hundreds as blue, I created a Piet Mondrian “masterpiece.” The focus was to teach second-graders their ones, tens, and hundreds places and the relationships between digits and their place value. My own memory of learning such things was of boring, rote exercises that left me cold. Here, I hadn’t had so much fun with scissors and construction paper in ages. And to think – I was learning math! 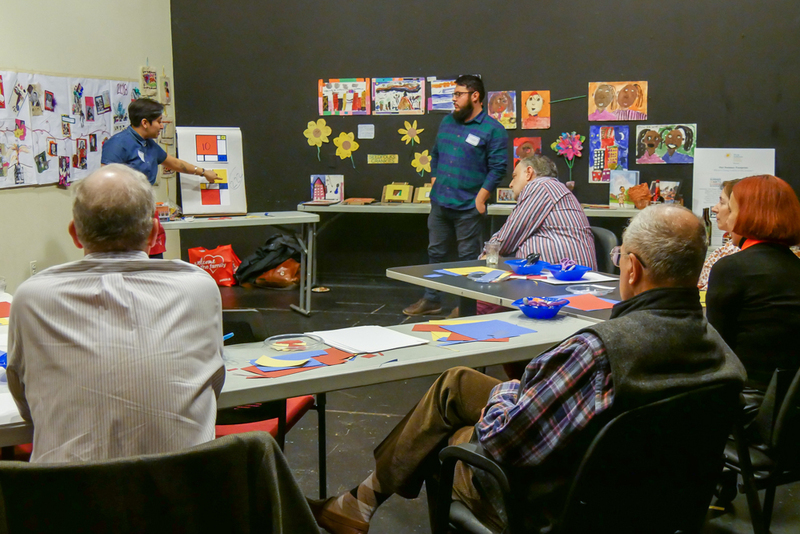 Artist/teacher pair Nadia Rea Morales and Jose Hernandez teach math with the help of Piet Mondrian. I ended the evening with teaching artist Christina Cook, who was surrounded by a variety of percussion instruments. As she demonstrated how these were used to sound out the syllables in words, I noticed how she was combining both math and vocabulary – a certain number of syllables to express a phrase, as she beat the rhythm on her drum. She then handed out instruments and instructed us to follow along. In addition, she said she used this technique to help the pre-K kids she taught to express their emotions. At first, she told us that the students mostly stuck to “happy” or “sad,” but soon she noticed that, as the kids gained confidence with the percussion pieces, their emotional range expanded, too. 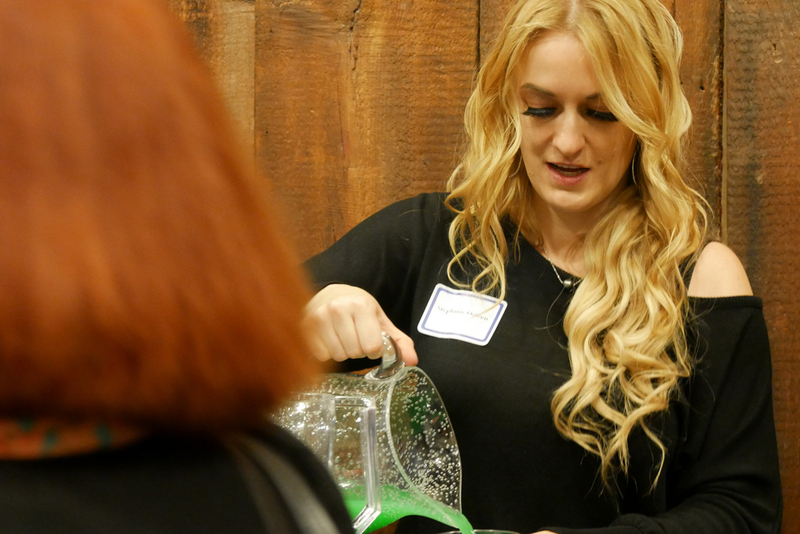 Now they were “curious” and “frustrated” and “ecstatic.” She admitted that she was impressed with the varying emotions the kids conveyed as well as the fact that they already had the vocabulary to communicate it. They had only needed the little nudge the music gave them to open up and express themselves more fully. 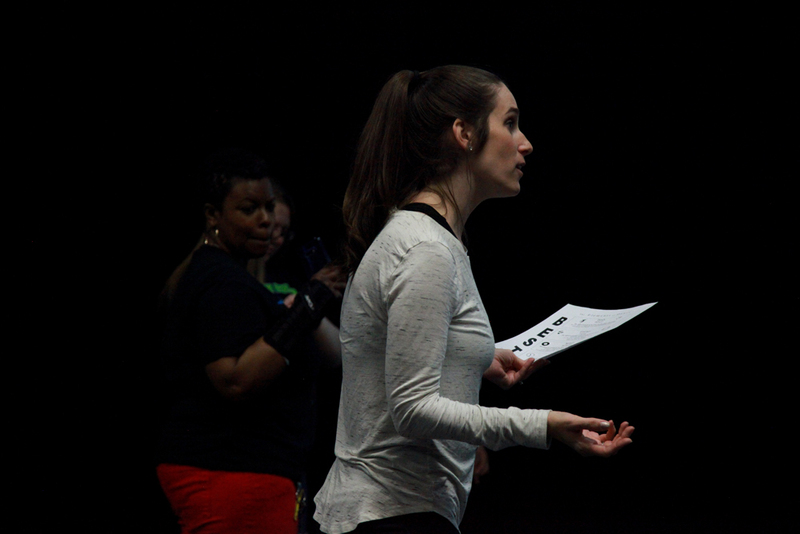 SALA teaching artist Christina Cook leads a lesson in identifying emotions and counting syllables through drumming. I have to admit – Inspire, Imagine, Improve is a mantra I can really get behind. Because each time I’ve attended Art Crawl, I come away inspired by all the people who donate time, expertise and/or money to make SALA a reality for 2,100 elementary school-age kids. I can only imagine how much harder it would be for the children and their teachers if this summer program didn’t exist. And I know that Young Audiences’ aim to improve test scores and access to arts-integrated learning is something I’m behind 100 percent. 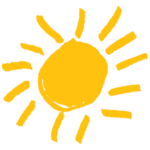 Wouldn’t you like a little Inspire, Imagine, Improve in your life? Come join us next year and I think you’ll find your own stories of imagination that inspire you to improve. Until then, Happy Holidays! Seedfolks. Bizz Buzz. 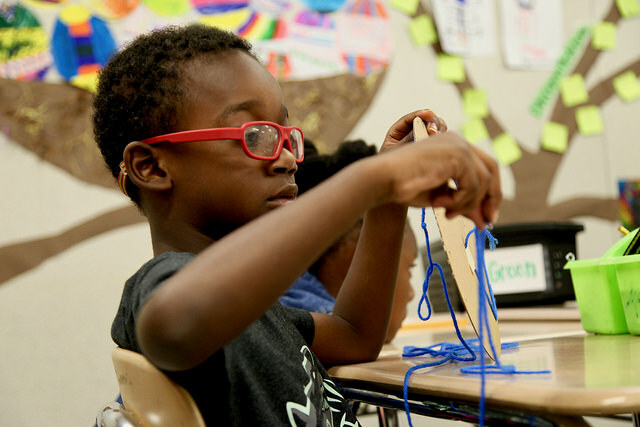 These are just a couple of the new things I learned about when I visited the Summer Arts and Learning Academy at Thomas Jefferson Elementary/Middle School in Baltimore. 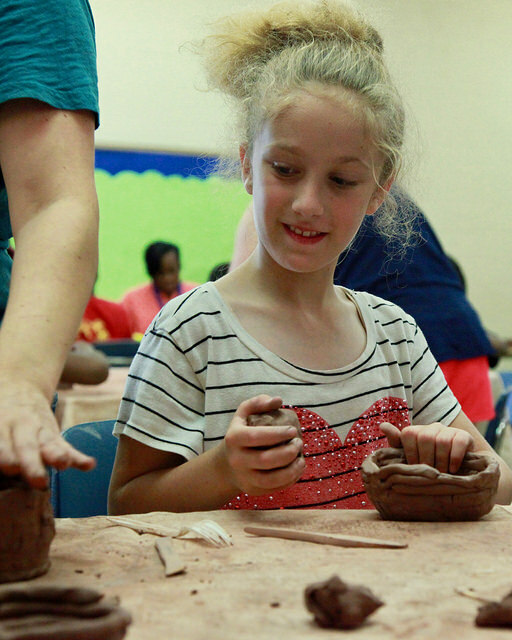 And learning through the arts is the whole point of this summer academy, now in its third year of operation. 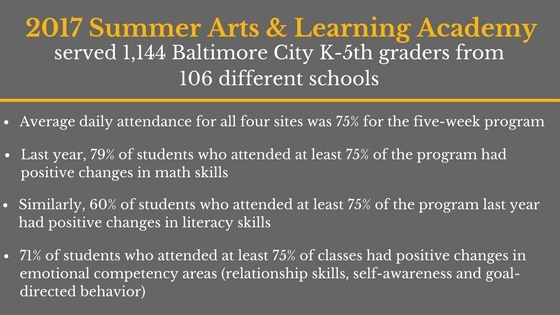 Young Audiences/Arts for Learning, in partnership with Baltimore City Public Schools, operates four of these academies at schools throughout the district as part of a system-wide arts-integrated strategy to reduce summer learning loss in literacy and math. Approximately 1,144 kindergartners through fifth graders take advantage of this free, fun-filled educational opportunity. My first stop was to meet Site Director Kristin Taylor who manages the program at Thomas Jefferson. As we headed to the first classroom of fifth graders, she enthusiastically filled me in on the size of this particular academy (280 students), its average daily attendance (250 students), and the benefits provided at every site to help parents and kids (after-school care until 6:00 pm and free breakfasts and lunches served every day to each student). 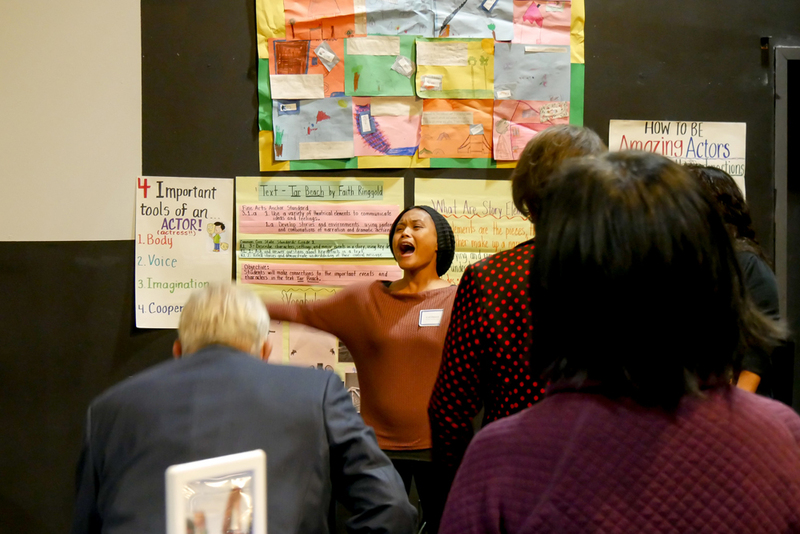 As we walked through the halls, student-created posters, snippets of conversations, and the sounds of music offered glimpses of the learning that was taking place. 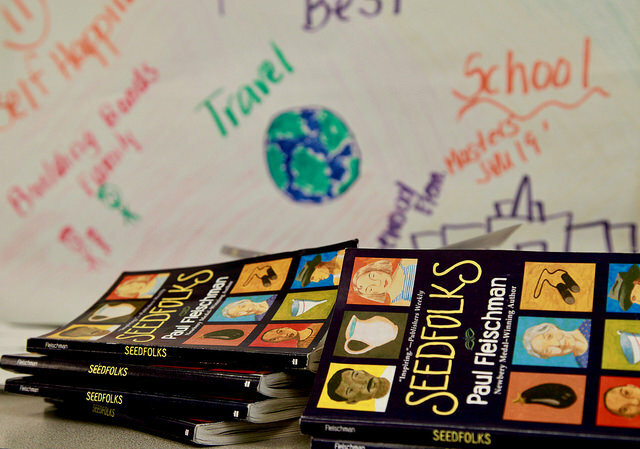 I entered the fifth-grade classroom of Ms. Paige and visual artist Mama Sallah just in time to watch a production of a chapter from Seedfolks, a book that shows how a neighborhood is transformed as people from different cultures interact in a garden. After the first group performed, I got a chance to ask Kenaya, one of the student actresses, about the book. She explained to me that each chapter of the book focused on a different character. The classroom had been divided into groups, each assigned to act out a different chapter of the book. These groups were to then silently act out what the narrator was reading. 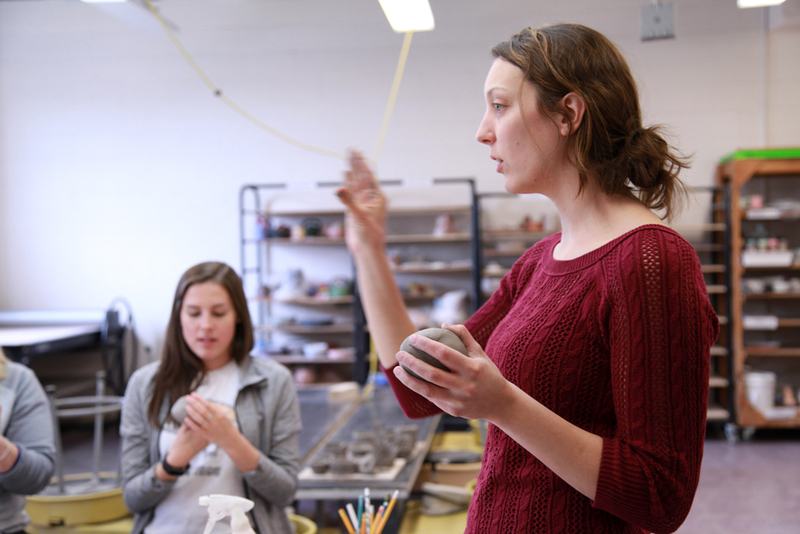 Mama Sallah and a visual art student during one of many afternoon arts major and arts exploration classes. Kenaya’s group focused on Kim, a Vietnamese girl from the first chapter. The story starts with the girl staring at a portrait of her father. While one student narrated, others acted out the parts of Kim, the father’s portrait, and even more characters as the action moved into the garden Kim had planted. I enjoyed watching their attention to the story and how each child handled their role, whether it was bending down to dig in the “dirt” or, like the young man playing the role of the portrait, staring silently into space, giving no indication that he was anything other than a photograph frozen in time. These were serious actors, hard at work. I have to admit I never did quite get the idea of when you yelled, “Buzz!” or “Bizz!” instead of a number, so I guess I’m going to have to admit that I am NOT as smart as a fifth grader. Luckily, they are! The next classroom was filled with third graders who were also working on math. However this time the class focused on word problems and measurements. Without the drama of Bizz Buzz, this classroom was much quieter with children working at their desks. As I wandered around the room, one outgoing and cheerful girl, Mikhia, came up to me. I probably looked a little lost because she explained to me what was going on – how they were learning about different cultures. I asked her if she liked the Academy, and she grinned broadly and nodded her head, yes. “The teachers,” she answered without hesitation. The last classroom I visited was composed of first graders. I noticed a colorful picture on one boy’s desk of a volcano with a person going up the side of it and asked him about it. “Who’s that?” I asked, pointing to the person. By now the girl in line behind him decided she had to help this poor confused person. Explaining patiently but emphatically, she corrected me. “It’s not powerful. It’s imagination!” At which point, I learned that their classroom was focusing on stories that dealt with imagination. So, yes, flying makes perfect sense. I’d rather fly over a volcano than walk up it, too! 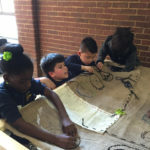 As the children headed off to lunch, I thought about my first morning at Young Audience’s Summer Arts and Learning Academy and all the kindergarten through fifth-grade pros who had guided me through the learning process. I realized I had learned a lot, too. For example, I learned that reading and acting out the story is a powerful way to concentrate on both the characters and the narration. I learned that math can be extremely riveting and exciting. I learned that different cultures can guide your math skills. And I learned that I need to let my imagination soar. But most importantly, I learned that combining arts with learning is fun – and effective – and that’s why the kids love it. Pam and I in her studio stitching in a few finishing touches on a student-made embroidery project. 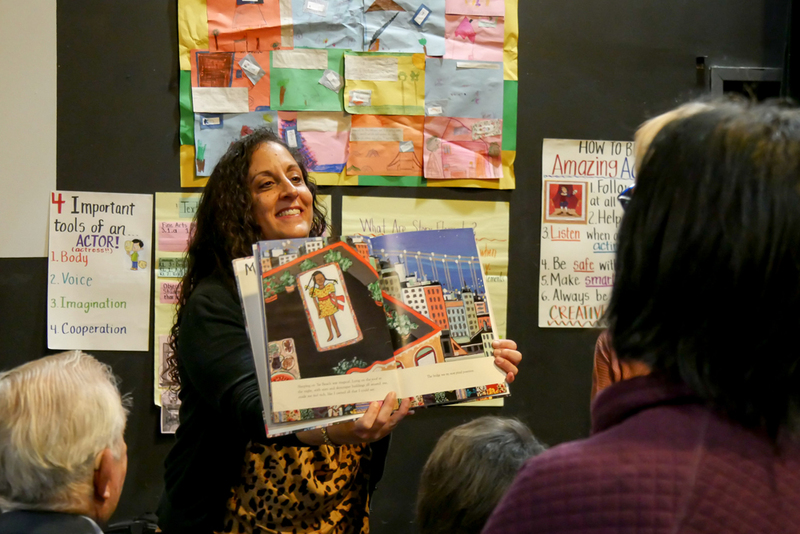 Co-written by Barbara Kesler, an active Young Audiences board member, volunteer, and retired Baltimore County Public Schools teacher and YA Visual Artist Pam Negrin. During Barbara’s 39-year teaching career, she instructed third through sixth-grade students and spent the last 23 years at Franklin Elementary where she taught fifth graders in all subjects. 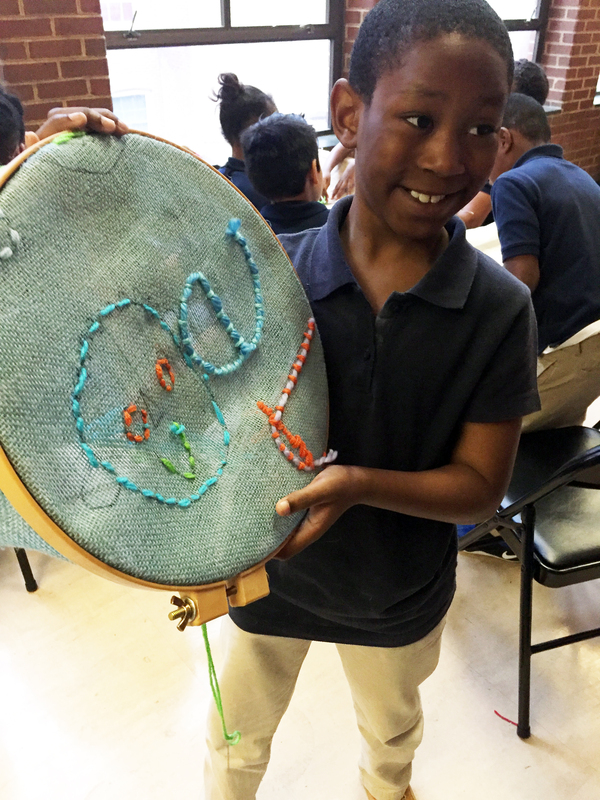 After attending a Young Audiences informational “Impact Breakfast,” six of my friends and I were intrigued by visual artist Pam Negrin’s embroidery and weaving with students. 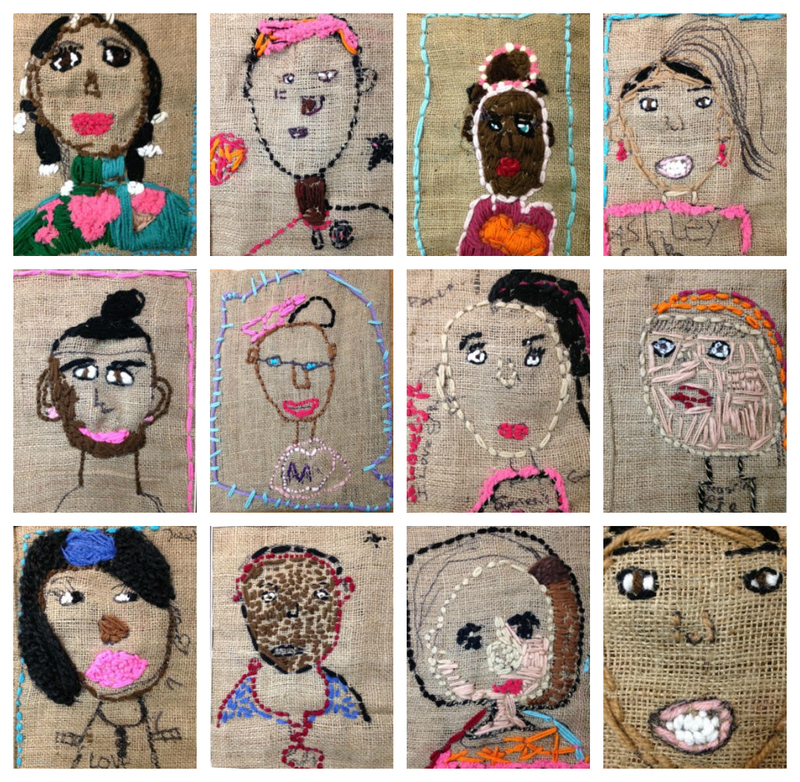 Pam’s residencies transform classrooms into collaborative handwork studios, with countless ways to connect textile art with core subjects. We learned that Pam’s hours of preparation, finishing work, and providing one-on-one attention in a classroom of 25-30 students was challenging. 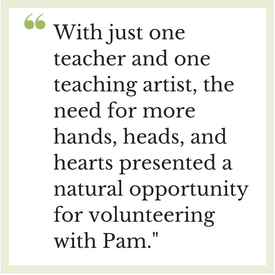 With just one teacher and one teaching artist, the need for more hands, heads, and hearts presented a natural opportunity for volunteering with Pam. 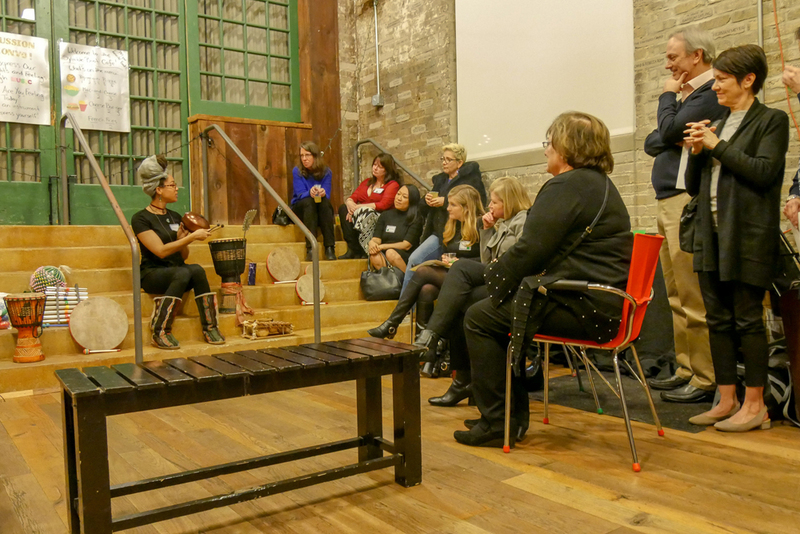 Our volunteering experience happened both in the classrooms and at Pam’s studio. Throughout the experience, new friendships have developed and inspirations shared. 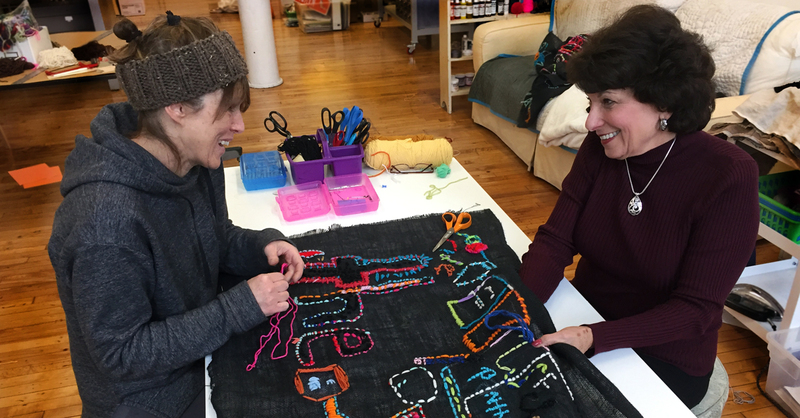 Meeting at Pam’s studio, we help while learning; rolling yarn, threading needles, and helping finish collaborative projects. 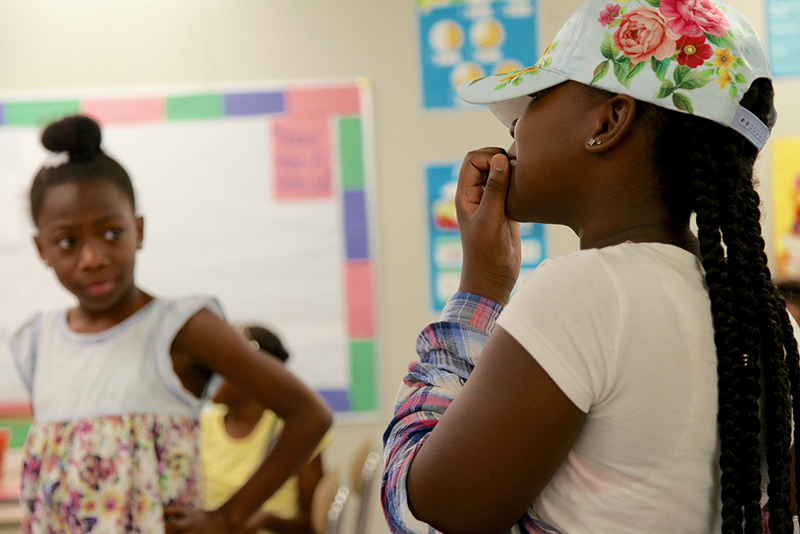 In the classroom, our presence helps individual children feel successful in their completed works—sometimes by giving extra help with a new skill, sometimes by organizing materials, and other times just by listening while they work! 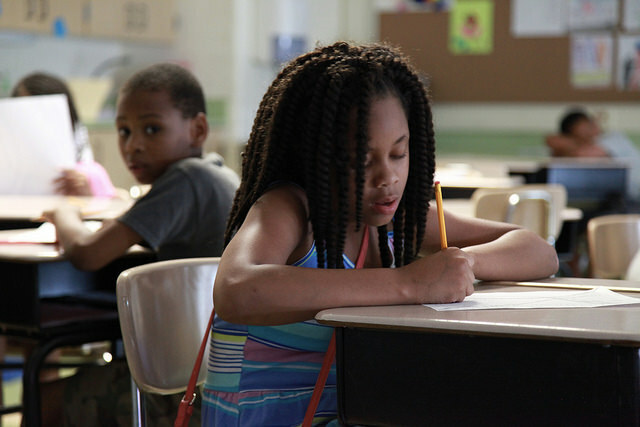 During a Spring residency at Commodore John Rodgers Elementary in Baltimore City, two English Language Arts third-grade classes were exploring character traits of a recently read Judy Blume novel. 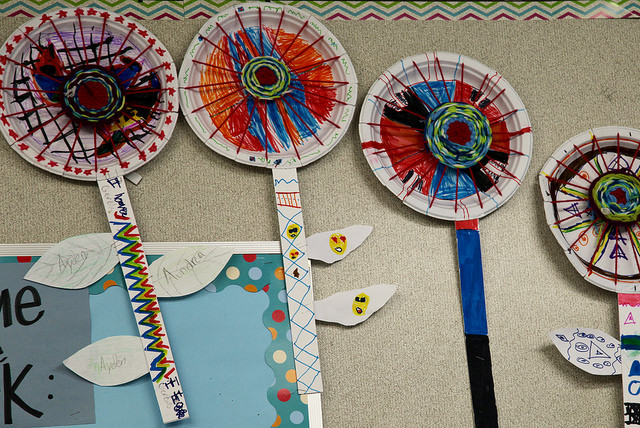 Expanding this textual element to their own character traits, the children designed self-portraits. 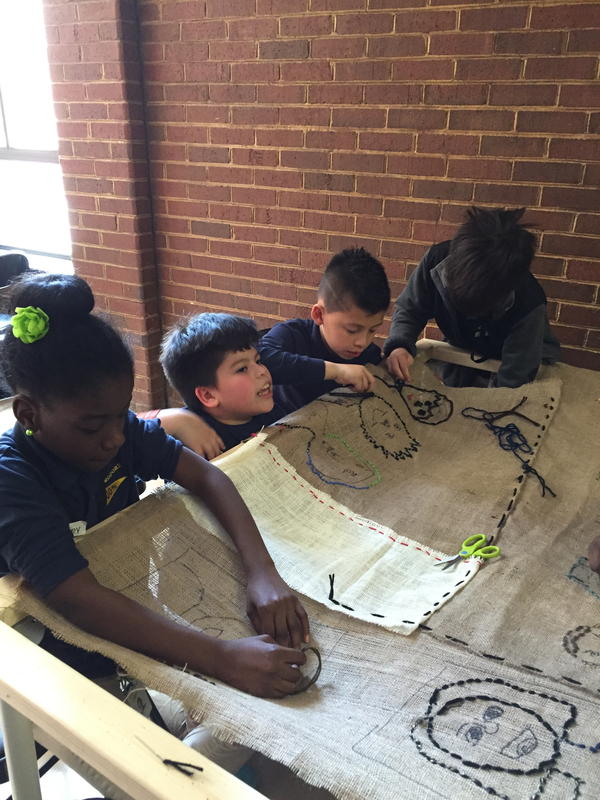 The designs started on paper and were then embroidered onto fabric. Pam instructed them to explore color values, textures, and shapes. Three volunteers accompanied Pam to the school to assist the very enthusiastic children in creating their self-portraits. The results were amazing. 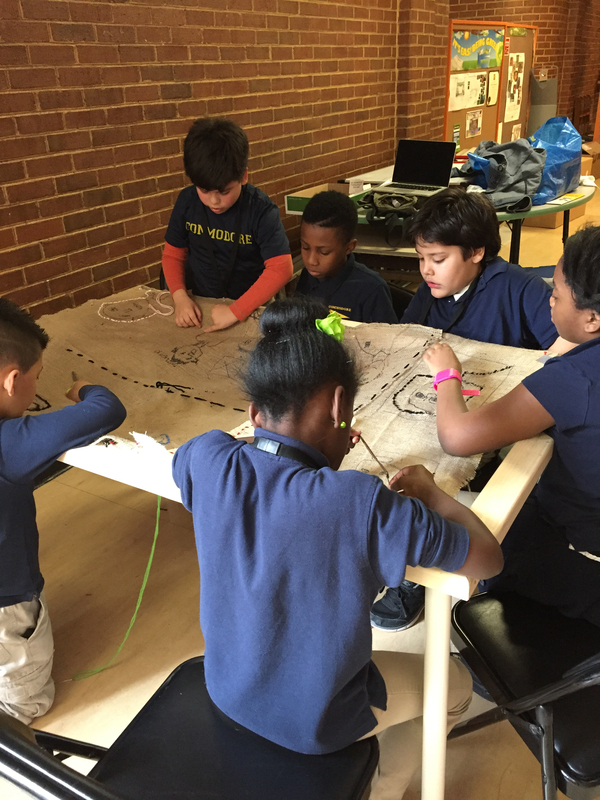 Children were working together at sewing tables, chatting amicably about the novel that they were reading in class, their sports activities, and their weekend plans. All were engaged in a very peaceful and friendly manner, helping each other when necessary. No doubt presenting their finished projects to their families on Mother’s Day was a beautiful culmination of this artistic endeavor. And it left three very happy volunteers with a feeling of purpose in assisting these youngsters in a meaningful project that will surely be an unforgettable experience. 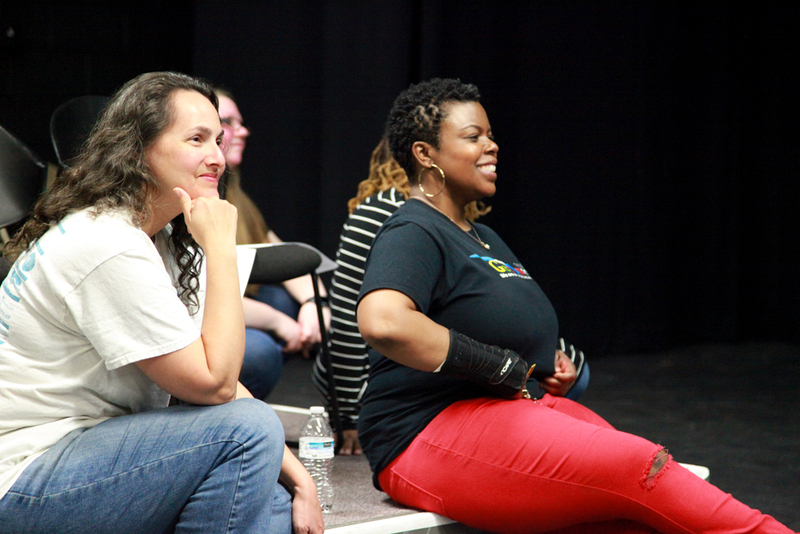 At Young Audiences, we constantly see the arts inspire, engage and change lives. 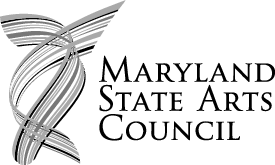 We are reminded of this power every day through our work providing more than 7,000 arts learning experiences a year to children in Maryland classrooms. And the benefit extends beyond the children, impacting the providers, observers, supporters and, yes, volunteers. 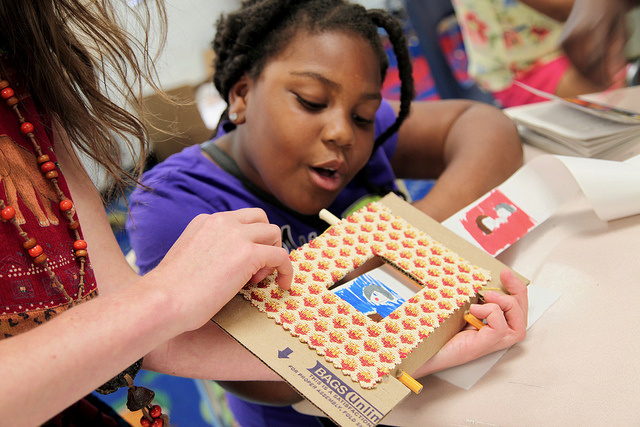 Learn more about how you can get involved with Young Audiences through volunteering. Digital photography is an art form that provides instant gratification. You can see your progress faster than you would with painting, drawing, or ceramics. Because of the age we live in, people are multimedia-driven and our society works efficiently with cell phones, computers, and the internet. I find that digital photography is yet another way technology has changed our approach to a task, and I believe it integrates well into education. Technology can give relevance to the art of photography, while also lowering a barrier. 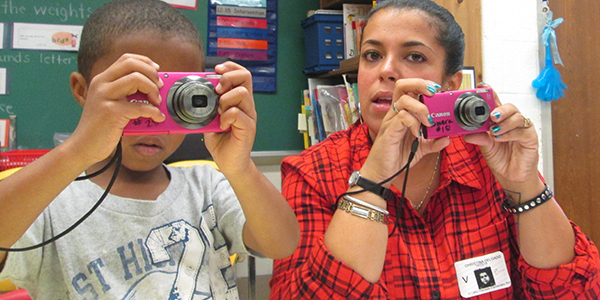 Easy-to-use digital cameras allow students to see themselves as artists and to express themselves creatively. This is something I wanted to teach my second- to fifth-grade students at Moravia Park Elementary when I began my residency with teacher partner and good friend, Cicely Jones, at the school in January. 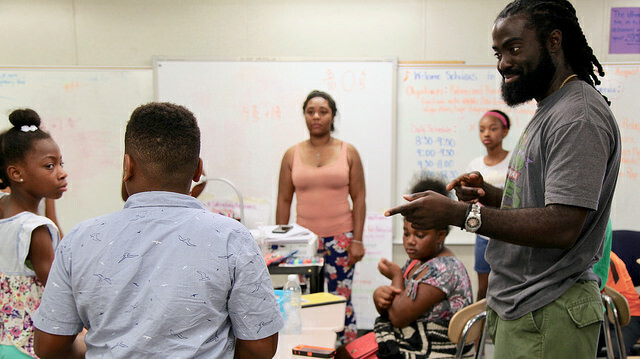 I worked with students who were a part of the school’s P.R.I.D.E. 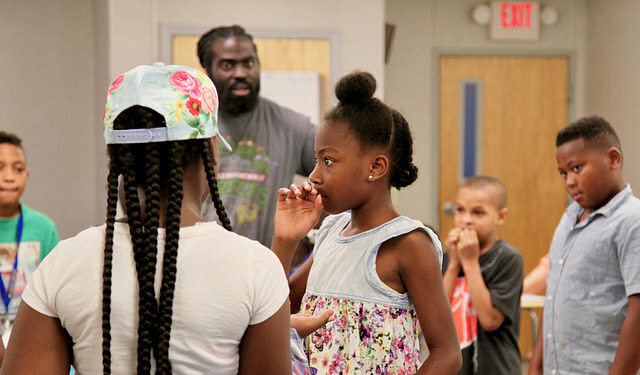 program, which supports students with social and emotional learning differences. I started by giving students an overview of cameras and portrait photography. I wanted to teach them how to effectively take pictures and understand a photo’s ability to communicate feelings and ideas. Children aren’t always aware of how they are surrounded by photography every day. When they are looking at magazines or billboards, those are photographs! Getting them to understand how this art form is relevant to their everyday lives was important to their development throughout this residency. The project I assigned students was based on a book of famous portraits that I found in a local bookstore. It showed all kinds of unique examples of portraiture, including Oprah, President Obama, and Billie Holiday. These pieces not only showed portraits of the individuals, but it also mapped out a collage of drawings, symbols, and words explaining what was important to each subject. I had students build something similar so that they could share their own perspectives. Collaging items from magazines with their own photographs helped them define their sense of identity as they pieced the parts together. 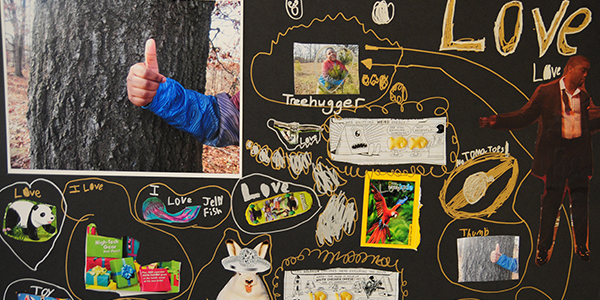 Their collages focused upon various aspects of their worlds, including interests, hobbies, and what makes them feel safe. 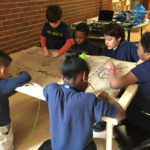 Some students really connected with each other through this project. One student, Trevor*, took the initiative to help another student who was having trouble focusing by sitting down with him, helping him cut out images, and discussing the project. Together, they were able to complete the work on the project for that day. With Cicely and our faculty team, we came up with an idea that would give the students some independence. We provided disposable cameras to each of the students so that they could create images on their own time. This allowed the students to share a more well-rounded view of who they were. Giving them that responsibility really made a difference. 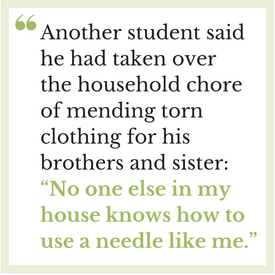 Students felt important because they were expected to do something at a higher level–it was a very special moment. Ultimately, the whole experience was wonderful and I appreciated the fact that Cicely brought me in to be a part of their team. During the final residency meeting, I got emotional after hearing what Cicely had to say about the improvement she had seen in her students during the residency. There were less behavioral issues and attendance was up. 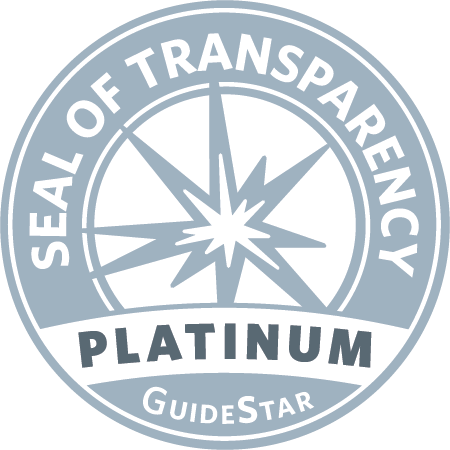 Hearing that positive change validated what I do. Sometimes it’s easy for artists to feel like the things they do go unseen, but this experience had an enormous impact upon the students I met. They were coming to school and they were staying positive and being productive. As children grow up, there are moments in their lives that they will never forget. I think these memories will go far. 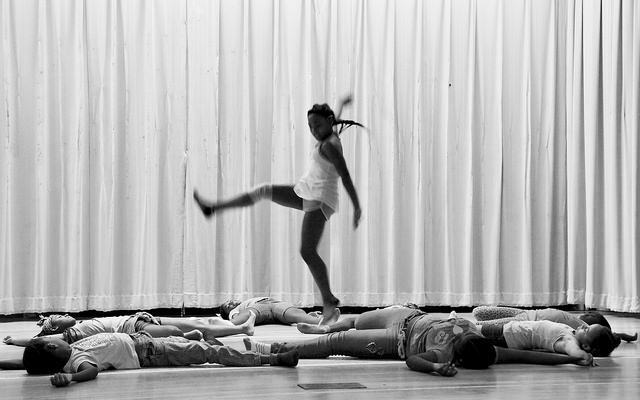 Learn more about Christina’s photography residency programs for schools at yamd.org. 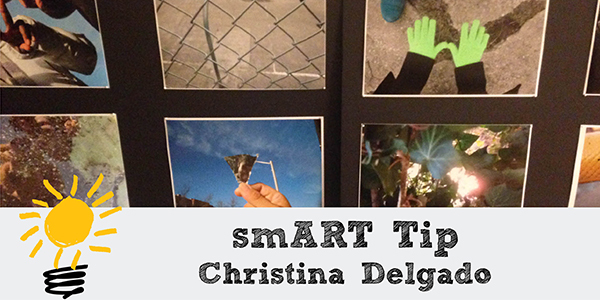 In our December smART Tip, Young Audiences visual artist Christina Delgado shares how to organize a photo scavenger hunt for students that can easily be tailored to connect with any subject or unit. Learn how to get started with this fun activity in the short video below. 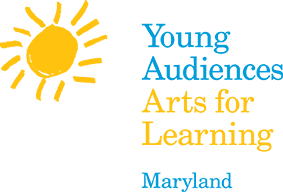 smART Tips is a monthly video series sharing tips for educators who are interested in new, creative ways to use the arts in their classroom with students. See all smART Tips to date here. Interested in a specific topic? Let us know!